No Author A Narrative of "Griswold," the African Youth, from the Mission School, at Cape Palmas, Who Died in Boston, May 16, 1844. 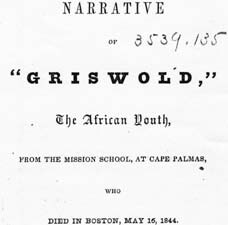 A Narrative of "Griswold," the African Youth, from the Mission School, at Cape Palmas, Who Died in Boston, May 16, 1844. Boston: Published by a Friend of Missions, 1845. Episcopal Church -- Missions -- Africa. Griswold, A. V. (Alexander Viets), ca. 1826-1844. Boston Public Library provided the text for the electronic publication of this title.